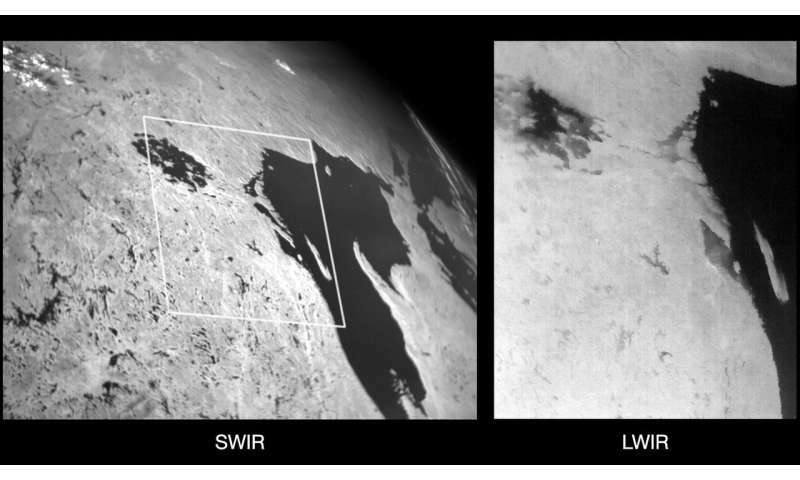 These two images of Lake Superior and surrounding area show the first data downlinked from the CubeSat Multispectral Observation System (CUMULOS) cameras. The image on the left, taken by a short-wavelength infrared camera, captures a larger area of the lake and shows strong contrast between land and water features. The narrower field of view image on the right taken by the payload's long-wavelength infrared camera indicates a difference in water temperature between the lake's center and the water in the bays and inlets. CUMULOS is testing the performance of commercial sensors for weather and environmental monitoring missions. The cameras are designed for point-and-stare imaging and allow nearly simultaneous coverage of Earth regions from an orbital altitude of 280 miles (452 kilometers). CUMULOS is hosted as a demonstration of an experimental payload on NASA's Integrated Solar Array and Reflectarray Antenna (ISARA), which is managed by NASA's Jet Propulsion Laboratory in Pasadena, California, and operated by The Aerospace Corporation.